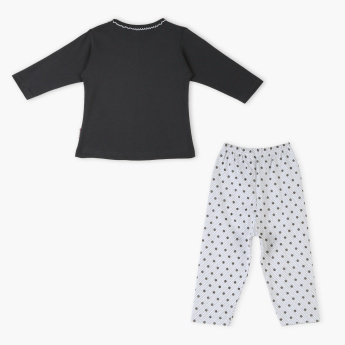 Your little one will sleep soundly dressed in this printed t-shirt and pyjama set, owing to its soft and breathable fabric. The round neck t-shirt has long sleeves to keep your baby warm and features stitch detailing for style. The elasticised waistband of the pyjamas ensures a snug yet comfortable fit.